For those of you doing POCs or Testing Lab, here's how to disable SSL or HTTPS requirement for Citrix Receiver. And set the value to "A" and restart the receiver. This is also useful for those troubleshooting connection between Citrix Receiver and Xenapp Server. But take note though that this is not recommended for production environment since you are exposing the user's credentials in the network. Can't wait to check them out especially on Hyper-V! 1. Installed the first SCOM 2012 Server located on Data Center 1. 2. Installed second SCOM 2012 Server also on Data Center 1. 3. Installed third SCOM 2012 Server on Data Center 2 and enocuntered the error. 1. Make sure that the credentials used in installing SCOM 2012 have rights on the remote SQL Server. 2. Verify connectivity between Server and Remote SQL Server. 3. Check firewall ports on Remote SQL Server. 4. *this resolved my issue* Do a WBemTest from the Server to the Remote SQL Server. If you get "RPC Server Unavailable", it means that RPC Ports are blocked, either at the Remote SQL Server or your network firewall. Make sure to open RPC ports 135, 137, 139 and 445 to resolve this issue. This error may be due to SCOM Setup unable to determine the version of SQL on the Remote Server and thus displaying the error message. I've recently installed Windows Server 2012 on my laptop for testing and lab purposes and what do I get, I cannot connect to the wireless router! 1. Logon to the server using SCVMM Service Account. 3. 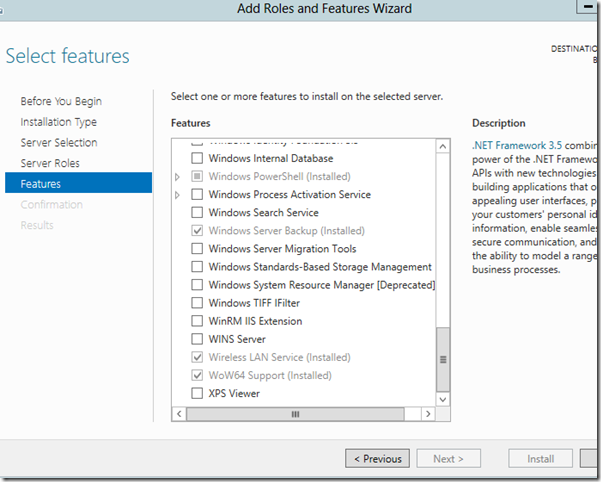 Start the installation wizard for SCVMM 2012 SP1. 4. 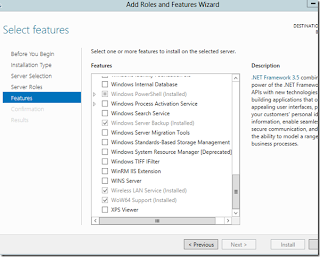 Under Select Features to install, select both Management Server and Console. 5. Enter your Username and Organization and input the Product ID(if no product key was typed, SCVMM will go into evaluation mode). 9. Select default installation location. 11. Under Database Configuration, input your SQL Server on Server Name, Port 1433 under Port, your SQL Instance for Instance Name and select New Database – VirtualManagerDB. 12. Under Configure service account and distributed key management, select Domain Account and input your SCVMM Service Account and its password. 13. Select default Port Configuration. 14. Select default Library Configuration. 15. Verify the Installation Summary and start the installation. Okay, here's a good scenario on System Center Orchestrator. You create a runbook that connects to a remote server. You tried to start/stop a service but it failed or gives you a warning or error. So how do you resolve this issue? I've tried so many other ways as being told in other sites but the simplest thing worked out for me. Add the Orchestrator run as account as local administrator on remote server that the runbook is working with. And whoala, the runbook can now start/stop a service! If you want to check other permissions required, check it out here. 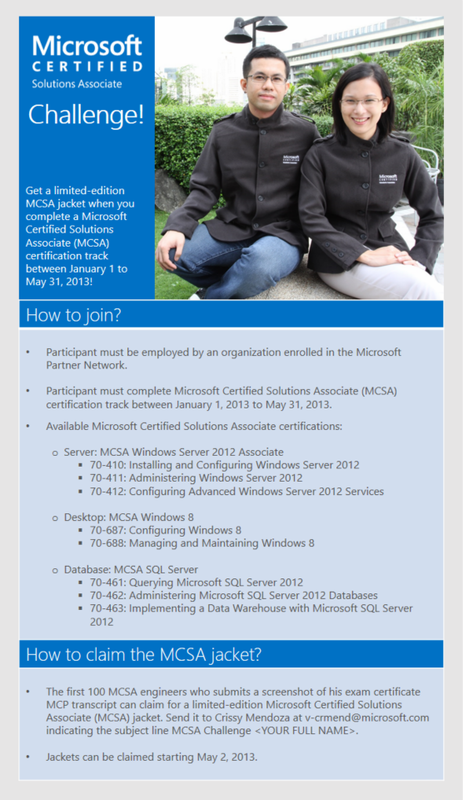 Visit Microsoft Partners Philippines for more details. This is a great day! I'm now officially selected a Microsoft vTSP! I'll be working closely with MSFT with regards to Pre-Sales and Implementation of Hyper-V 2012, WS 2012 and System Center 2012. I'm hoping to learn more from this program and hope to level up more in this industry of Cloud Computing! I recently found out this morning that my SCOM Server was down and after logging in to my SCOM I see that my management server is greyed out. Partial fix that worked for me was to fix the error first that says " partitioning and grooming processes for the operational database (OperationsManager) on the server scom, 1433 have either not been run recently or have been failing. At the time this alert was raised, the partitioning and grooming process had not completed for 1 days." Verify the SQL server if there are any errors and the SCOM events. After that let the error resolve on its own. If the management server wont go green, restart the affected SCOM server. Logout and Sign in as a Sharepoint Administrator. From SCSM 2012 Portal, select Site Permissions (located on Sharepoint Tab). You'll see a warning "This Web site inherits permissions from its parent (Team Site)". Select Manage Parent. Add the group/users of choice, to give general permissions, add the group Domain Users and make sure to tick/give Read Permissions. Basically, after installing Service Manager 2012 Web Parts, the only user that can access the Self-Service Portal is the Sharepoint Administrator. So make sure to add the required users to the list after installing the Web Parts. I've recently encountered one of the strangest flaw on SCSM 2012, and it's installing all of Service Manger 2012 Web Part on Windows Server 2012. So to install Service Manger 2012, you're going to need Sharepoint 2010, may it be Foundation or Server. But note that Sharepoint 2010 only supports up to Windows Server 2008 R2. Even if you have SP1, still it's a no go. And Sharepoint 2013 is not supported by Service Manager 2012. So the answer to the question on can we install all of Service Manager 2012 Web Parts on Windows 2012? NO, you cannot install ALL Service Manager Web Parts until an SP2 for Sharepoint 2010 or Service Manager 2012 receives an SP2(that provides support for Sharepoint 2013). What you can do (if you still want to use Windows Server 2012) is to have a separate Sharepoint Server on Windows 2008 R2 and let it host the Sharepoint Web Part. So what are you waiting for? Grab the link here and start preping for the exams! By the way, these exams comes with Second Shots! For those who are looking for training videos on Windows Server 2012, you might be interested in these videos for jump start training here. These videos are intended for those who would want to upgrade their MCITP certifications to MCSE: Desktop Infrastructure, or MCSE: Server Infrastructure, or MCSE: Private Cloud. 8. Use compatible authentication, mutual has the highest security. What a pain! This error has been bugging me since morning and thankfully I have found a way of resolving this. *Note: This has been tested on Windows 2008 R2 while installing SQL 2008. The problem seems to be on the .NET 3.5 installation that you did as a prerequisite for SQL 2008. To resolve this we need to add another feature. Some users find that closing all running applications except the SQL Installation works. I'm transferring my blog to Blogger.com because buying a domain with weebly is too much of a pain. So hold on while I transfer all the contents of my blog to this new one.